Hershey Felder. Photo courtesy Christopher Ash. Ludwig van Beethoven has left perhaps the largest legacy of any classical musician, with such seminal works as Für Elise, Moonlight Sonata, and the famous “Da-da-da-DUN” of his Fifth Symphony. And yet we mostly see Beethoven as a marble bust upon a shelf, a machine who created beautiful music, instead of the flawed, tormented human he really was. Pianist/actor/playwright Hershey Felder illustrates the struggle between joy and misery within the composer in his one-man show Hershey Felder, Beethoven, which brings to life a person whom most of us have known only as a distant legend. 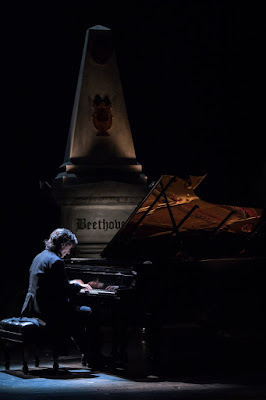 Hershey Felder, Beethoven is not approached from Beethoven’s perspective: Perhaps Felder thought an outside look would better illustrate Beethoven’s complexities, or that Beethoven’s inner struggles were too complicated to be retold truthfully from his view. What we get instead is fragments of Beethoven’s life, death, and struggle with deafness, from the perspective of Gerhard von Breuning, his former caretaker. This framing is a more honest way of discussing a historical figure about whom little is known; the audience leaves the theatre still asking questions that may never be answered. Felder’s acting dwells at two extremes: His portrayal of von Breuning is clipped and composed, calmly asking the audience to hear his side, while his portrayal of Beethoven is wild, driven to paroxysms of joy and rage. We don’t get tired of either character because Felder switches between them so often, and, in fact, discover new facets of their personalities every time we return to them. Other incidental characters, such as the point-of-view character’s father, are portrayed with delicacy and nuance. 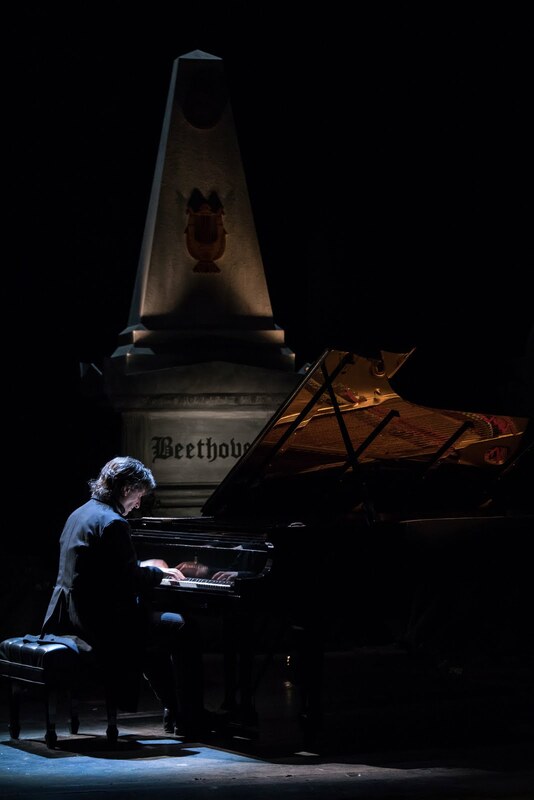 Unlike most one-person shows, Hershey Felder, Beethoven is interspersed with Felder’s emotionally charged piano performances of some of Beethoven’s best-known work. This is vital for the performance, as it shows, not tells, the sheer impact of the music and allows us to experience for ourselves its timeless power. Interspersed between the music, Felder points out Beethoven’s love for composing in C minor, Beethoven’s melody speaking to us above the rhythmic base in the Moonlight Sonata, and many other insights into Beethoven’s legacy, which allows us to appreciate his music on a higher level. Hershey Felder, Beethoven is a glimpse into what little we know of one of the greatest, most complex musicians in Western history. Knowing Beethoven’s flaws doesn’t bring him down to earth, but instead gives us more insight into a composer who, while fraught with despair and rage, was nevertheless able to produce works of tremendous beauty. Even for those with only a passing familiarity with Beethoven and his works, this one-person show will bring tears to your eyes.